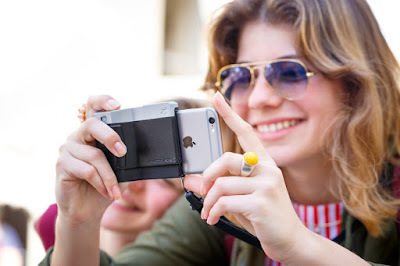 There’s nothing we wont see, a new accessories for iPhone now makes it possible for you to literally turn your iPhone into a real camera using Pictar. Pictar makes using your iPhone camera a lot more comfortable with its case that turns your iPhone to a full blown camera. The Pictar case as buttons like a normal camera: which includes the shutter buttons that also works for focus when pressed halfway, a zoom ring, a selfie button, an exposure wheel, and a smart wheel which can be be used to perform other functions. Pictar also comes with mount that lets you attach accessories such as flash, and there’s also a tripod mount. However it doesn’t come with an attached lens which means your photos are still taken with the iOS lens. You might be wondering how it connects with the iPhone, well Pictar doesn’t connect with the iPhone via bluetooth or direct connection, it communicates with its camera app on the phone making use of sound. Each of the wheels and buttons give special sounds which the app can interpret to perform different functions.